As controversial terms like "post-feminism" and "post-racial" continue to shape our understandings of politics and culture today, canonical figures and a new generation of black women writers continue to grapple, deconstruct, and redefine those terms with contemporary literature. 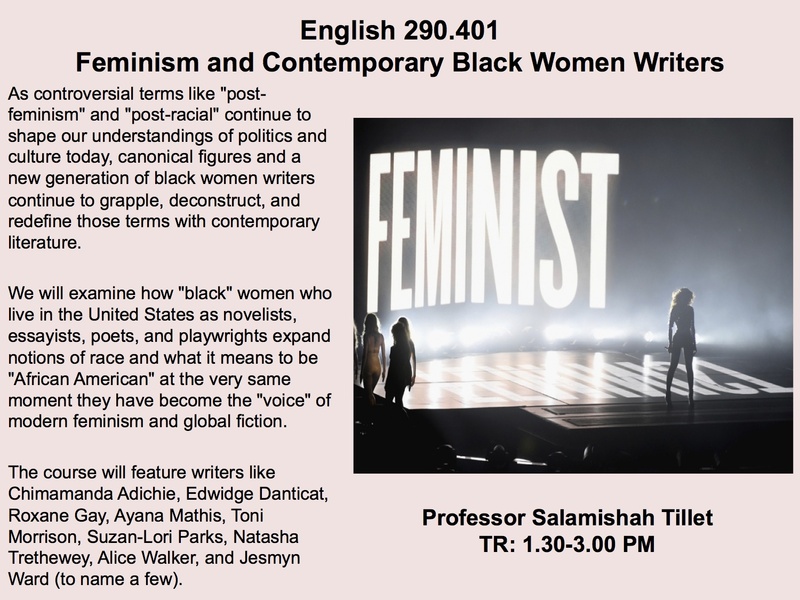 We will examine how "black" women who live in the United States as novelists, essayists, poets, and playwrights expand notions of race and what it means to be "African American" at the very same moment they have become the "voice" of modern feminism and global fiction. The course will feature writers like Chimamanda Adichie, Elizabeth Alexander, Edwidge Danticat, Roxane Gay, Ayana Mathis, Maaza Mengiste, Toni Morrison, Lynn Nottage, Suzan-Lori Parks, ZZ Packer, Emily Raboteau, Nelly Rosario, Natasha Trethewey, Jesmyn Ward, and Alice Walker (to name a few).